U.S. Secretary of State John Kerry testifies before a House Foreign Affairs Committee hearing on the Iran nuclear agreement in Washington, July 28, 2015. U.S. Secretary of State John Kerry told skeptical lawmakers Tuesday that if the U.S. rejects the internationally brokered Iran nuclear deal there would be "no restraints" on Tehran developing a nuclear weapon. "It's a good deal for the world, a good deal for America, a good deal for allies and our friends," Kerry told the House Foreign Affairs Committee. The U.S. Congress is in the early stages of a 60-day review of the pact crafted by the U.S., Britain, France, Germany, China and Russia over months of negotiations. Kerry called for the Republican-controlled Congress to approve the accord, saying that if the United States rejects it, "we would have squandered the best chance" to control Iran's nuclear program. Tehran agreed to restraints on its nuclear program and international inspections in exchange for lifting United Nations and Western sanctions that have hobbled its economy. But Kerry warned, "If we walk away (from the deal), we walk away alone," because international sanctions would be lifted. He said if the deal is not approved, there would "no inspections, no sanctions, no restraints" on Tehran's nuclear program. 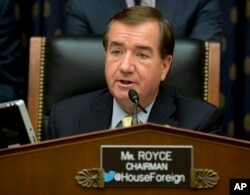 FILE - House Foreign Affairs Committee Chairman Ed Royce, R-Calif. speaks on Capitol Hill in Washington. Congressman Ed Royce, the Republican chairman of the foreign affairs panel, voiced his skepticism about the deal as the hearing opened. "Has Iran earned the right to be trusted?" he asked. "If this deal is approved, Iran gets a boost to its international stature. "We appreciate President (Barack) Obama's effort to secure the most intrusive inspections in history," Royce said. "But it came up short." The lead Democrat on the committee, Congressman Eliot Engel, said there are "a number of issues" he finds "troublesome" about the deal. "Fifteen years from now Iran will be essentially off the hook" for compliance with the agreement, he said, a contention Kerry rejected. Congress has about seven weeks left in its window to look over the agreement. The United Nations Security Council approved the terms last week, setting off a timetable that could see sanctions lifted by the end of the year. Royce called it "backwards and wrong" that the U.N. voted on the pact before the U.S. Congress completes its review. President Barack Obama answers questions about the Iran nuclear deal during a news conference in the East Room of the White House in Washington, July 15, 2015. Kerry appeared before the panel along with Energy Secretary Ernest Moniz, who met repeatedly with Iranian officials to close the long-sought agreement earlier this month, and Treasury Secretary Jacob Lew. The three secretaries took part in a similar hearing in the Senate Foreign Relations Committee last week where Kerry said rejecting the deal would be turning away from the best chance to peacefully resolve the issue of Iran's nuclear activity. U.S. President Barack Obama has vowed to veto any congressional rejection measure, meaning both the House and Senate would need to muster two-thirds majorities to override the president and refuse to lift congressionally imposed sanctions. Those sanctions, along with ones put in place by the United Nations and European Union, came in response to allegations that Iran was using its nuclear technology to pursue nuclear weapons. 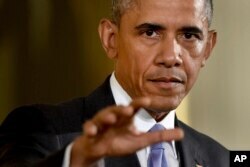 Iran has denied the allegations and insisted the nuclear program is peaceful. It sought sanctions repeal as the main element of the agreement that limits its enrichment activity and subjects its nuclear sites to enhanced U.N. monitoring.